A friction blister is a soft pocket of raised skin filled with clear fluid caused by irritation from continuous rubbing or pressure. 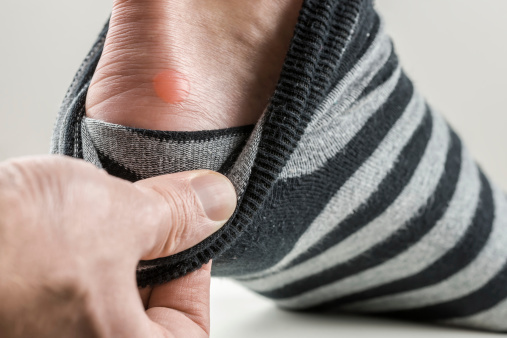 Friction blisters usually occur on the feet, where tight or poor-fitting shoes can rub and irritate delicate toes and heels for long periods of time. This type of irritation causes minor damage to the skin and the tissue just beneath the skin, then fluid accumulates just beneath the outermost layer of skin. If the irritation is enough to damage small blood vessels, the blister also may contain blood, and is then called a blood blister. A friction blister is a small pocket of puffy, raised skin containing clear fluid. It is usually painful when touched. A blister can appear anywhere.